William Hazlitt, the son of an Irish Unitarian clergyman, was born in Maidstone, Kent, on 10th April, 1778. His father was a friend of Joseph Priestley and Richard Price. As a result of supporting the American Revolution, Rev. Hazlitt and his family were forced to leave Kent and live in Ireland. The family returned to England in 1787 and settled at Wem in Shropshire. At the age of fifteen William was sent to be trained for the ministry at New Unitarian College at Hackney in London. The college had been founded by Joseph Priestley and had a reputation for producing freethinkers. In 1797 Hazlitt lost his desire to become a Unitarian minister and left the college. While in London Hazlitt became friends with a group of writers with radical political ideas. The group included Percy Bysshe Shelley, Samuel Taylor Coleridge, Charles Lamb, William Wordsworth, Thomas Barnes, Henry Brougham, Leigh Hunt, Robert Southey and Lord Byron. At first Hazlitt attempted to become a portrait painter but after a lack of success he turned to writing. Charles Lamb introduced Hazlitt to William Godwin and other important literary figures in London. In 1805 Joseph Johnson published Hazlitt's first book, An Essay on the Principles of Human Action. The following year Hazlitt published Free Thoughts on Public Affairs, an attack on William Pitt and his government's foreign policy. Hazlitt opposed England's war with France and its consequent heavy taxation. This was followed by a series of articles and pamphlets on political corruption and the need to reform the voting system. Hazlitt began writing for The Times and in 1808 married the editor's sister, Sarah Stoddart. His friend, Thomas Barnes, was the newspaper's parliamentary reporter. Later, Barnes was to become the editor of the newspaper. In 1810 he published the New and Improved Grammar of the English Language. In 1813 Hazlitt was employed as the parliamentary reporter for the Morning Chronicle, the country's leading Whig newspaper. However, in his articles, Hazlitt criticized all political parties. Hazlitt also contributed to The Examiner, a radical journal edited by Leigh Hunt. Later, Hazlitt wrote for the Edinburgh Review, the Yellow Dwarf and the London Magazine. In these journals Hazlitt produced a series of essays on art, drama, literature and politics. During this period he established himself as England's leading expert on the writings of William Shakespeare. Hazlitt wrote several books on literature including Characters of Shakespeare (1817), A View of the English Stage (1818), English Poets (1818) and English Comic Writers (1819). In these books he urged the artist to be aware of his social and political responsibilities. Hazlitt continued to write about politics and his most important books on this subject is Political Essays with Sketches of Public Characters (1819). In the book Hazlitt explains how the admiration of power turns many writers into "intellectual pimps and hirelings of the press." Hazlitt's marriage to Sarah ended in 1823 as a result of an affair with a maid, Sarah Walker. Hazlitt wrote an account of this relationship in his book Liber Amoris. In 1824 Hazlitt married Isabella Bridgewater but this relationship only lasted a year. In theThe Spirit of the Age: Contemporary Portraits (1825) Hazlitt provides a series of contemporary portraits including Samuel Taylor Coleridge, William Wordsworth, Robert Southey, William Cobbett, William Godwin and William Wilberforce. This was followed by The Plain Speaker (1826) and Life of Napoleon (4 volumes, 1828-30). William Hazlitt died in poverty of stomach cancer on 18th September 1830. It is not easy to write a familiar style. Many people mistake a familiar for a vulgar style, and suppose that to write without affectation is to write at random. On the contrary, there is nothing that requires more precision, and, if I may so say, purity of expression, than the style I am speaking of. It utterly rejects not only all unmeaning pomp, but all low, cant phrases, and loose, unconnected, slipshod allusions. It is not to take the first word that offers, but the best word in common use; it is not to throw words together in any combinations we please, but to follow and avail ourselves of the true idiom of the language. To write a genuine familiar or truly English style, is to write as anyone would speak in common conversation who had a thorough command and choice of words, or who could discourse with ease, force, and perspicuity, setting aside all pedantic, and oratorical flourishes. Or, to give another illustration, to write naturally is the same thing in regard to common conversation as to read naturally is in regard to common speech. It does not follow that it is an easy thing to give the true accent and inflection to the words you utter, because you do not attempt to rise above the level of ordinary life and colloquial speaking. You do not assume, indeed, the solemnity of the pulpit, or the tone of stage-declamation; neither are you at liberty to gabble on at a venture, without emphasis or discretion, or to resort to vulgar dialect or clownish pronunciation. You must steer a middle course. You are tied down to a given and appropriate articulation, which is determined by the habitual associations between sense and sound, and which you can only hit by entering into the author's meaning as you must find the proper words and style to express yourself by fixing your thoughts on the subject you have to write about. Any one may mouth out a passage with a theatrical cadence, or get upon stilts to tell his thoughts; but to write or speak with propriety and simplicity is a more difficult task. Thus it is easy to affect a pompous style, to use a word twice as big as the thing you want to express: it is not so to pitch upon the very word that exactly fits it out of eight or 10 words equally common, equally intelligible, with nearly equal pretensions, it is a matter of some nicety and discrimination to pick out the very one the preferableness of which is scarcely perceptible, but decisive. A word may be a fine-sounding word, of an unusual length, and very imposing from its learning and novelty, and yet in the connection in which it is introduced may be quite pointless and irrelevant. It is not pomp or pretension, but the adaptation of the expression to the idea, that clenches a writer's meaning: - as it is not the size or glossiness of the materials, but their being fitted each to its place, that gives strength to the arch; or as the pegs and nails are as necessary to the support of the building as the larger timbers, and more so than the mere showy, unsubstantial ornaments. The florid style is the reverse of the familiar. The last is employed as an unvarnished medium to convey ideas; the first is resorted to as a spangled veil to conceal the want of them. Rouge high enough, and never mind the natural complexion. The vulgar, who are not in the secret, will admire the look of preternatural health and vigour; and the fashionable, who regard only appearances, will be delighted with the imposition. Keep to your sounding generalities, your tinkling phrases, and all will be well. Swell out an unmeaning truism to a perfect tympany of style. A thought, a distinction is the rock on which all this brittle cargo of verbiage splits at once. Such writers have merely verbal imaginations, that retain nothing but words. Nothing more is meant by them than meets the ear: they understand or mean nothing more than meets their eye. The web and texture of the universe, and of the heart of man, is a mystery to them: they have no faculty that strikes a chord in unison with it. They cannot get beyond the daubings of fancy, the varnish of sentiment. Objects are not linked to feelings, words to things, but images revolve in splendid mockery, words represent themselves in their strange rhapsodies. With a sovereign contempt for what is familiar and natural, they are the slaves of vulgar affectation - of a routine of high-flown phrases. Scorning to imitate realities, they are unable to invent anything, to strike one original idea. They are not copyists of nature, it is true; but they are the poorest of all plagiarists, the plagiarists of words. The Spirit of Monarchy is nothing but the craving in the human mind after the sensible and the One. It is not so much a matter of state-necessity or policy, as a natural infirmity, a disease, a false appetite in the popular feeling, which must be gratified. Man is an individual animal with narrow faculties, but infinite desires, which he is anxious to concentrate in some one object within the grasp of his imagination, and where, if he cannot be all that he wishes himself, he may at least contemplate his own pride, vanity, and passions, displayed in their most extravagant dimensions in a being no bigger and no better than himself. Man is a poetical animal, and delights in fiction. We make kings of men, and gods of stocks and stones: we are not jealous of the creatures of our own hands. We only want a peg or loop to hang our idle fancies on, a puppet to dress up, a lay-figure to paint from. We ask only for the stage effect; we do not go behind the scenes, or it would go hard with many of our prejudices. We see the symbols of majesty, we enjoy the pomp, we crouch before the power, we walk in the procession, and make part of the pageant, and we say in our secret hearts: there is nothing but accident that prevents us from being at the head of it. From the most absolute despot to the lowest slave there is but one step (no, not one) in point of real merit. As far as truth or reason is concerned, they might change situations tomorrow - they constantly do so without the smallest loss of benefit to mankind. Tyranny, in a word, is a farce got up for the entertainment of poor human nature; and it might pass very well, if it did not so often turn into a tragedy. The world has been doing little else but playing at make-believe all its lifetime. For several thousand years its chief rage was to paint large pieces of wood and smear them with gore and call them gods and offer victims to them - slaughtered hecatombs, the fat of goats and oxen, or human sacrifices - showing its love of show, of cruelty, and imposture; and woe to him who should peep through the blanket of the dark to cry: hold, hold. The game was carried on through all the first ages of the world, and is still kept up in many parts of it; and it is impossible to describe the wars, massacres, horrors, miseries, and crimes, to which it gave colour, sanctity, and sway. At length, reason prevailed over imagination so far, that these brute idols and their altars were overturned: it was thought too much to set up stocks and stones, golden calves and brazen serpents as bona fide gods and goddesses, which men were to fall down and worship at their peril. It was thought a bold stride to divert the course of our imaginations, the overflowings of our enthusiasms, our love of the mighty and the marvellous, from the dead to the living subject, and there we stick. We have got living idols, instead of dead ones; and we fancy that they are real, and put faith in them accordingly. We take a child from his birth and we agree, when he grows up to be a man, to heap the highest honours of the state upon him and to pay the most devoted homage to his will. Is there anything in the person, any mark, any likelihood, to warrant this sovereign awe and dread? No: he may be little better than an idiot, little short of a madman, and yet he is no less qualified for king. Can we make any given individual taller or stronger or wiser than other men, or different from what nature intended him to be? No; but we can make a king of him. We cannot add a cubit to the stature, or instill a virtue into the minds of monarchs - but we can put a sceptre into their hands, a crown upon their heads, we can set them on an eminence, we can surround them with circumstance, we can aggrandize them with power, we can pamper their appetites, we can pander to their wills. We can do everything to exalt them in external rank and station - nothing to lift them one step higher in the scale of moral or intellectual excellence. (5) In his book The Sprit of the Age, published in 1825, William Hazlitt included an attack on Lord Eldon, the government's Lord Chancellor. On all the great questions that have divided party opinion or agitated the public mind, the Chancellor has been found uniformly and without a single exception on the side of prerogative and power, and against every proposal for the advancement of freedom. He was a strenuous supporter of the wars and coalitions against the principles of liberty abroad; he has been equally zealous in urging or defending every act and infringement of the Constitution for abridging it at home. He has studiously set his face against Catholic emancipation; he laboured hard in his vocation to prevent the abolition of the Slave Trade. He signs a warrant in Council, devoting ten thousand men to an untimely death with steady nerves. Is it that he is cruel and unfeeling? No; but he thinks neither of their sufferings nor their cries; he sees only the gracious smile, the ready hand stretched out to thank him for his compliance with the dictates of rooted hate. The King's hand is velvet to the touch; the Woolsack is a seat of honour and profit. That is all he knows about the matter. 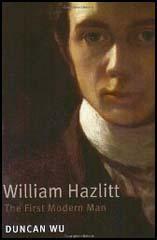 (6) William Hazlitt was criticized by the Tory press throughout his career. He retaliated by attacking The Quarterly Review in his book The Spirit of the Age, published in 1825. The editor and his friends systematically explode every principle of liberty and strike at the root of all free inquiry or discussion by running down every writer as a vile scribbler and a bad member of society, who is not a hireling and a slave. The intention is to poison the sources of public opinion and of individual fame, to pervert literature from being the natural ally of freedom and humanity into an engine of priestcraft and despotism, and to undermine the spirit of the English constitution and the independence of the English character. A master of English prose style, a beautifully modulated general essayist, the first great theatre critic in English, the first great art critic, a magnificent political journalist and polemicist like William Cobbett, whom he met and whom he describes affectionately in The Spirit of the Age, his greatest book, Hazlitt is both a philosopher and one of the supreme literary critics in the language. He is the critic as artist, to use Wilde's phrase, because he makes critical prose into imaginative action, so that the critic is redeemed from being simply the servant of the poet, the novelist, the playwright.